Besides vegans and vegetarians, who doesn't like a good cut of meat? Sure, there's a small selection of "freaks" and "weirdos" out there that, for some reason, can't stomach the taste of it, but for the most part, that list is fairly small. The love general love for beef is exactly why a place like Morton's Steakhouse in Las Vegas is able to thrive. Located less than a mile off of the Las Vegas Strip, Morton's offers a fine dining atmosphere that makes it an ideal place for those looking for that staple Las Vegas elegant dining experience. What can you get from Morton's? Of course, prime cuts of beef is at the top of that list, but there's fare more to this steakhouse than steak. Appetizers, soups, salads, poultry, seafood - it's all here under one roof, all cooked with the same care and expertise as the signature steaks. Take the ahi tuna tower. This succulent dish of ahi tuna is tender and marks the perfect starter for a great meal to come. 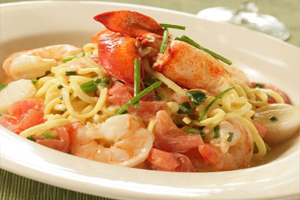 The Maine lobster cocktail, oysters Rockefeller, baked escargot, and prosciutto wrapped mozzarella are also prime dishes found amongst the appetizer menu. You can either bypass the appetizers and go for the soups and salads, tack on a soup or salad, or simply dine on a soup or salad for your entree. Regardless, your options are delectable, like the baked five onion soup, lobster bisque, caesar salad, sliced beefsteak tomato salad, chopped spinach salad, and Bibb lettuce salad. Made with fresh greens and other crispy, delightful ingredients, the salads are light and refreshing while the soups are seasoned perfection. Before you even consider a steak, take a look at your other options. Looking at the steak menu first will have your mind made up immediately, so it's best to get an idea of what else is out there. Items like the honey-chili glazed salmon fillet, braised beef short rib, shrimp Alexander, chilean sea bass fillet a la nage, Alaska king crab legs, and whole baked Maine lobster are great alternatives to a cut of red meat - but definitely no replacement. If you know steak, than you know that Morton's chefs excel at cooking them. From the center-cut prime ribeye to the cajun ribeye steak, both the flavor and temperature are perfection. These aged steaks are tenderized and seasoned to create the best possible flavor. 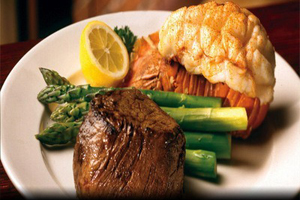 The center-cut filet mignon, porterhouse steak, and signature cut prime New York strip can be cooked to your liking. Have them cooked too much, and you'll dry out all of the flavor. Have your dinner served with a side of creamed spinach, creamed corn, twice baked au gratin potatoes, parmesan and truffle matchstick fries, or some simple onion rings to complete the experience of eating at Morton's. With perfect flavors infused in everything on your plate, you are bound to think that you've wound up at some signature steakhouse on the Strip. Finish your meal off with one of Morton's desserts, like the double chocolate mousse, creme brûlée, hot chocolate cake, souffle, or Haagen-Dazs ice cream, for a well rounded dining experience. Don't pay Strip prices just to get a well-cooked meal. Look to Morton's for that Las Vegas Strip experience with off-the-Strip pricing.